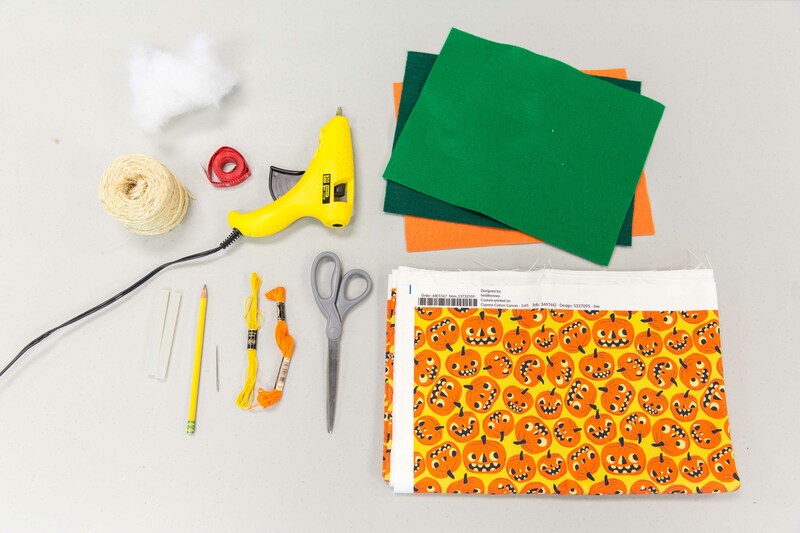 Pro tip: Use the Fill-a-Yard™ Cheater Quilt template to mix-and-match your pumpkin patterns. 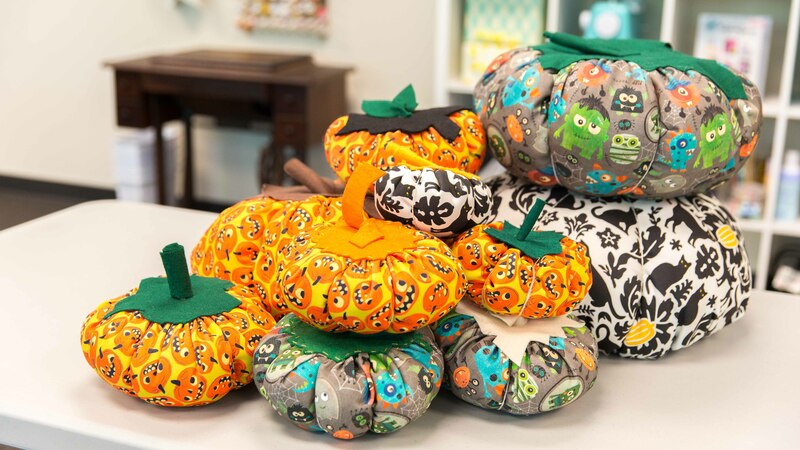 After creating your Halloween collection, fill nine 6″ squares (3×3) with the same design to create the small 16″ pumpkin. 1. Begin by drawing a circle on the wrong side of your fabric in the desired diameter. We are making a small pumpkin with an initially drawn diameter of 16”. 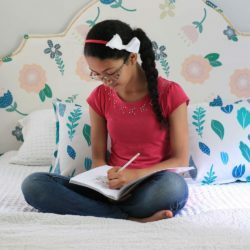 To make the center point, measure out 8″ in either direction, and draw a circle connecting both points. Cut out your circle. 2. Using a needle and strong thread, create a gathering stitch line along the outer rim of your circle about ¼” away from the raw edge. 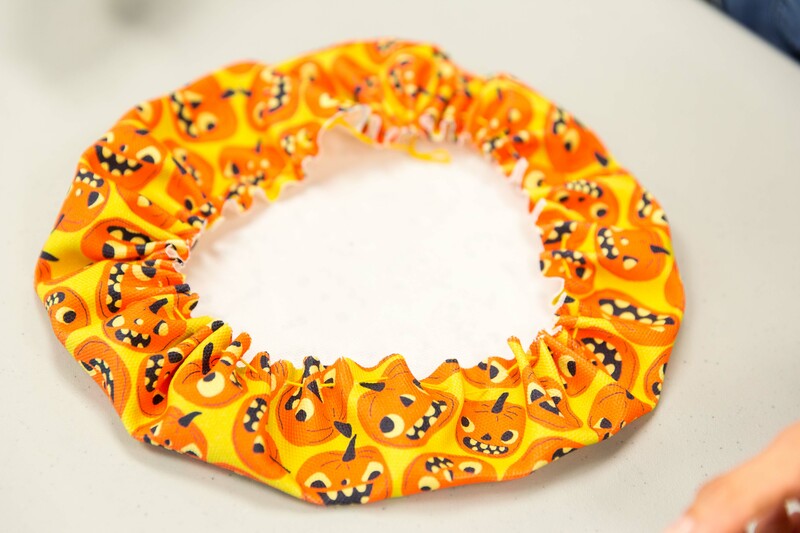 Gather the fabric so that it begins to make a rounded bowl (or pumpkin!) shape. Don’t cinch it too tight just yet as we still need to stuff it! 3. 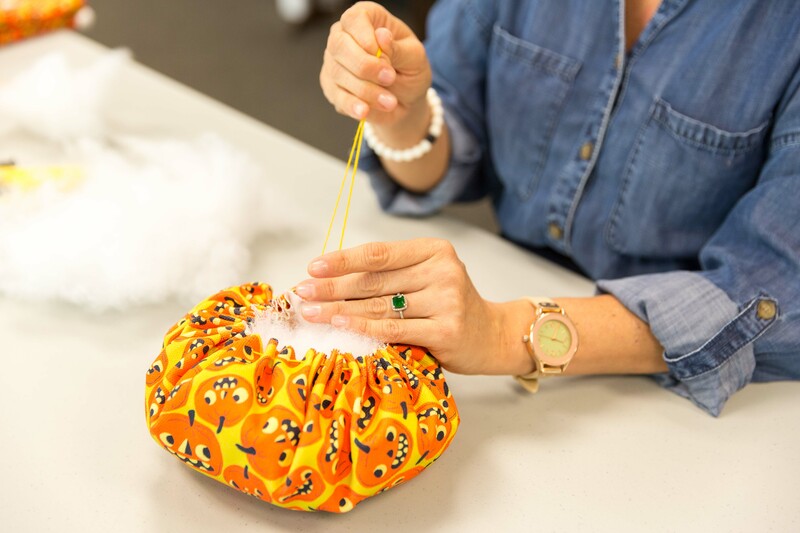 When you have a rounded shape formed out of your gathered fabric, stuff the inside of the form with your fiberfill or filling of choice. Continue to gather and cinch the pumpkin closed as you fill to create a solid, rounded form. Once you’ve stuffed your pumpkin to your desired fullness, cinch and knot the gathered opening closed. 4. Take your twine or yarn and cut it into 6-8 matching lengths. The lengths of twine should be long enough to wrap around your pumpkin. 5. 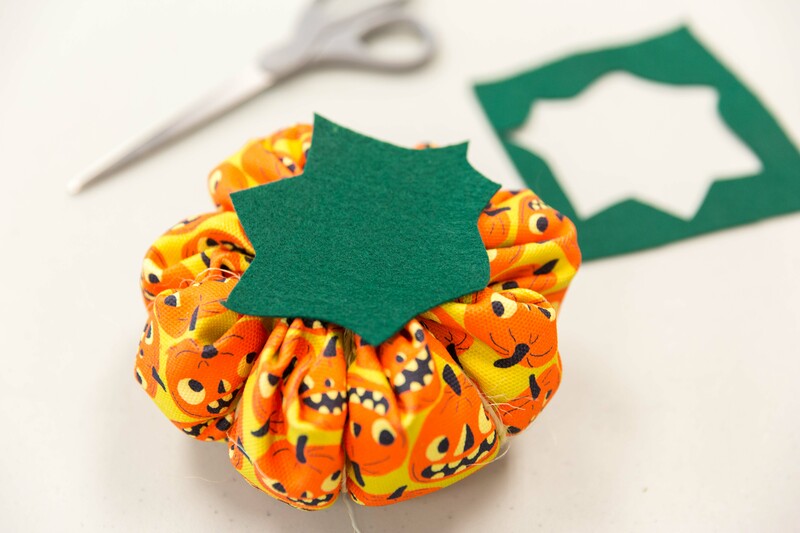 Tie one length of twine around your pumpkin, taking care that the knot is at the top of your pumpkin. 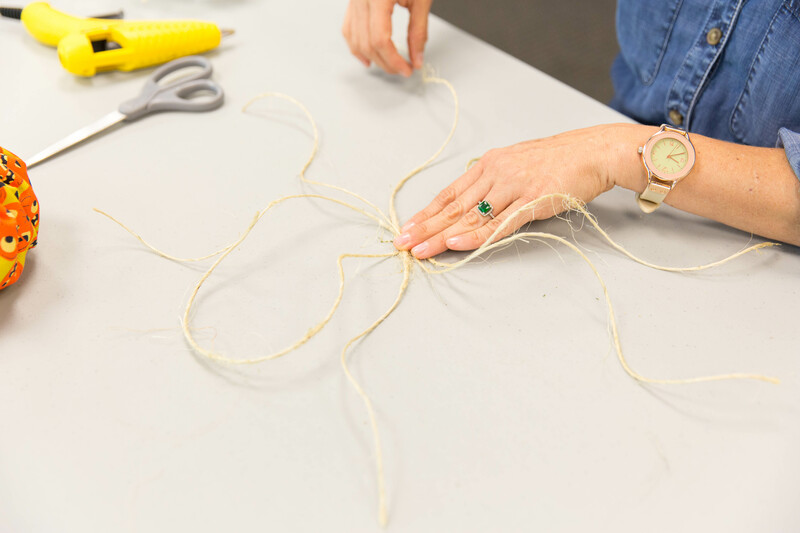 Pull the twine tightly before knotting to create puffy segments. Trim the excess twine. 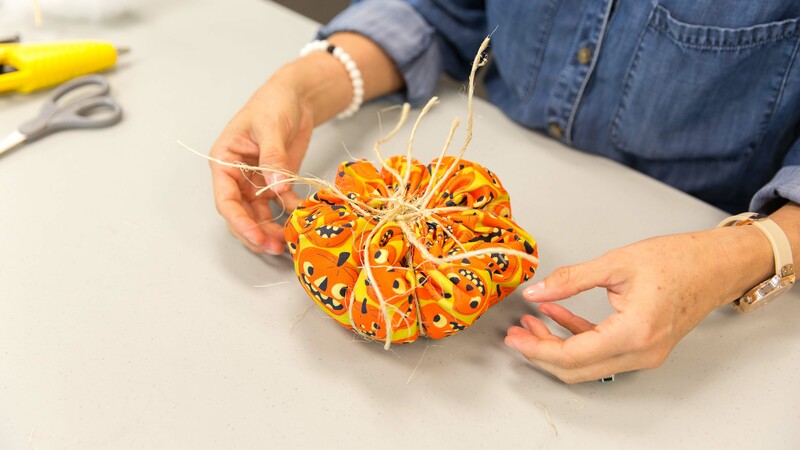 Repeat the process of wrapping the remaining twine around the fabric–it should be looking like a pumpkin now! 6. Take your coordinating felt or fabric of choice and cut out a leaf-shaped topper big enough to cover the gathered top and twine knots. 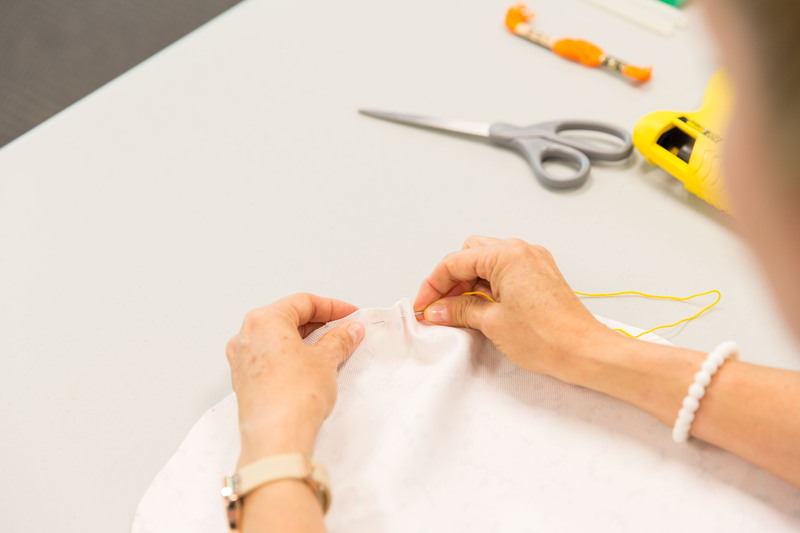 Hand stitch with decorative stitches or hot glue into place. 7. 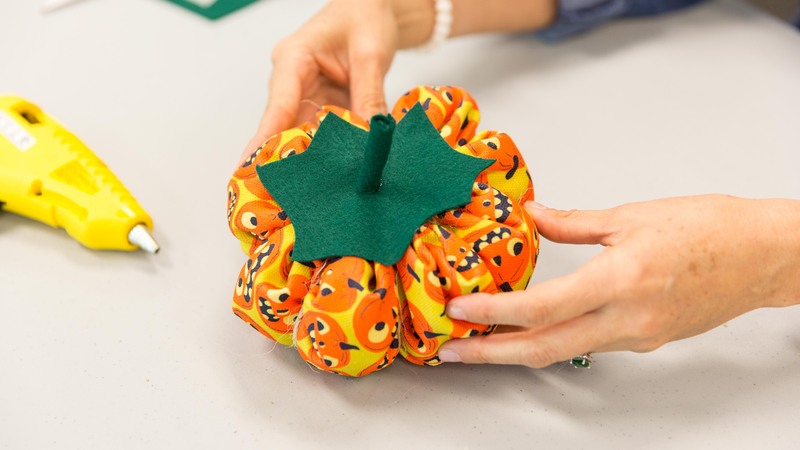 Take the remainder of your coordinating felt or fabric and create a rolled cone for your pumpkin stem. You can stitch or hot glue your stem together. Attach the stem to your topper with hot glue or hand stitch. And that’s all there is to it – now go make some more! Are you hosting Thanksgiving at your house this year? 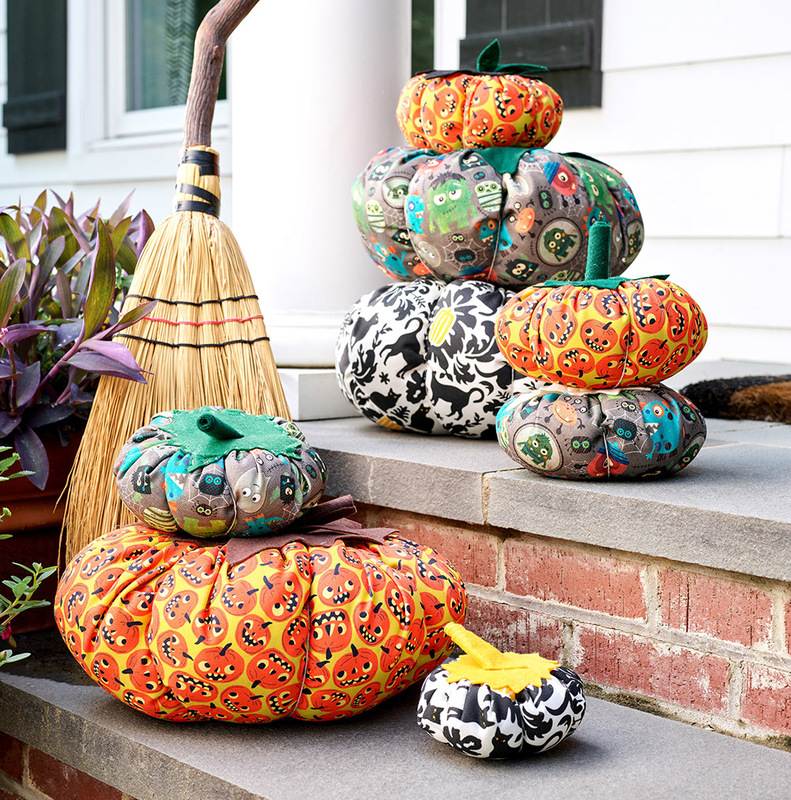 Replace these Halloween prints with rustic fall designs printed on Celosia Velvet™ for gourd-geous centerpieces! Wow, It’s looking so beautiful. You did it nicely. 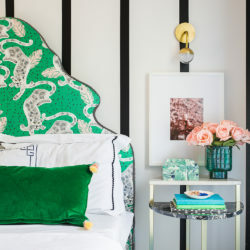 I also interested to make this for my home. I want to display it in my showcase. Hope so that it will be an exciting project for me. Thanks for the sharing this. I have two little girls that are going to love their little pumpkins thank you very much . OMG!!! THIS WOULD MAKE A GREAT CRAFT FOR KIDS. 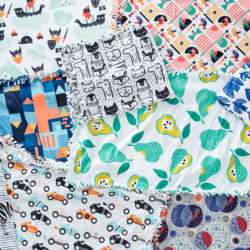 You could give them the fabric squares and let them cut out their own circles and fold the edge of the circle in a little and make tiny snips around the circumference maybe just six or seven depending on the size of the circle. Then just give them yarn or twine, or even ribbon to thread in and out of each hole all the way around until the two ends of the string meet and pull a little to fill. 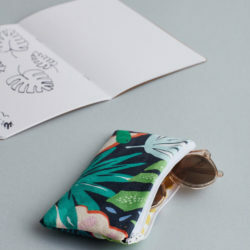 Could fill with paper scraps and treats for them to take home! I think I will go back to my old after school program and do this as my shared craft for the month of October! Thanks So much this idea! Happy Halloween/ Fall!